I have been trying to do a different range of paintings. 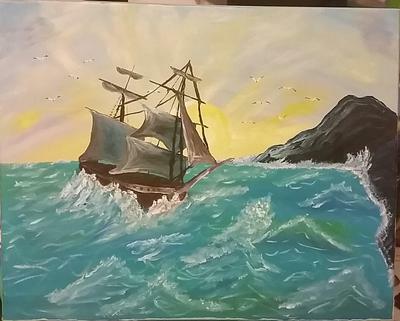 This is a sea/ship one I did recently (March 2015). I am so excited to see everyone's work on this site. There is so much talent out there. Thank you Mark for your site and allowing us artists a place to feel free to show our work. I love painting. With 2 little boys and being a stay home mom it's a nice get away to take an hour and go into another world. Bless my husband for giving me that time! Either to take a hike in the mountains, a swim in the ocean or watch a sunset!